Hello my pretties and welcome! It's Halloween and the trick or treaters will be knocking on my door soon so onto today's post. 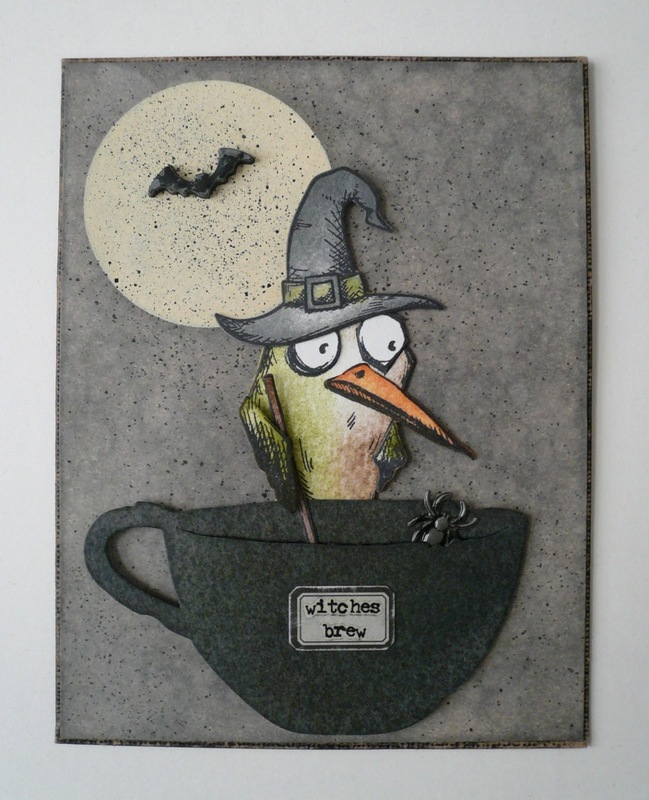 This weeks challenge over on the Simon Says Stamp Monday Challenge Blog is to choose a previous challenge so I picked the October 2013 "Spooky" challenge. I recently picked up the Tea Time Bigz Die and as your see I turned one of the cups into a caldron. Now my little witch can whip up some witches brew by the light of the Halloween moon. Thanks for stopping by and Happy Halloween! This is such an absolutely charming card! I love everything about it and think the teacup as a cauldron is BRILLIANT! This has such a great whimsical vibe to it and the label on the teacup looks fantastic, too. The background really sets the scene and the bat and spider add the perfect touch. You've got some great details here like putting the spoon handle under the bird's wing and I love all the little specks in the background. You did a wonderful job and I thoroughly enjoyed seeing this. Thanks for sharing your work with us for this week's Simon Says Stamp Monday Challenge!